I am proud to announce the release of Acire 0.4! Documentation Links – many snippets now include links to relavent documentation links, and these are shown right within the Acire interface and just a click away. Alphabetized Lists – the list of categories in Acire and the list of snippets in each category has now been alphabetized which makes navigating available snippets much easier. Number of snippets – the number of snippets that are currently available are now shown on the status bar. Link to how to add snippets – Acire is nothing without python-snippets, so I added a link in the Help menu to this page which explains how people can contribute snippets. Diverse Library Of Examples – via the Python Snippets library, Acire provides you with access to hundreds of available snippets spanning a wide variety of Python modules. New Snippets, Daily – for Ubuntu users, our library of Python Snippets is available in a package that is updated daily. We are always adding snippets, and they will be delivered to your system effortlessly. Browse Snippets Easily – snippets are organized into a series of categories which neatly map to Python modules. When you select a category you will see a list of available snippets. View Code – code for snippets is just a click away, using full syntax highlighting and respecting your Monospace font settings on your desktop. Test and Run Snippets – snippets can be run right from Acire with a single click. See a snippet running, browse the code and understand how it works. Play With Snippets Your Way – looking at a snippet’s code and want to change something to see what happens? No problem, edit the code, run it and have fun. When you are done you can even save your snippet to a file on your computer. Available In Your Language – Acire is available in multiple languages, with many more with each release. Installing Acire 0.4 is a doddle if you are running Ubuntu (Lucid and Karmic) or Debian, just follow the instructions. Right now Acire is not packaged for other distributions, but I would love it to be: drop me a line if it is and I will update the website with installation details. 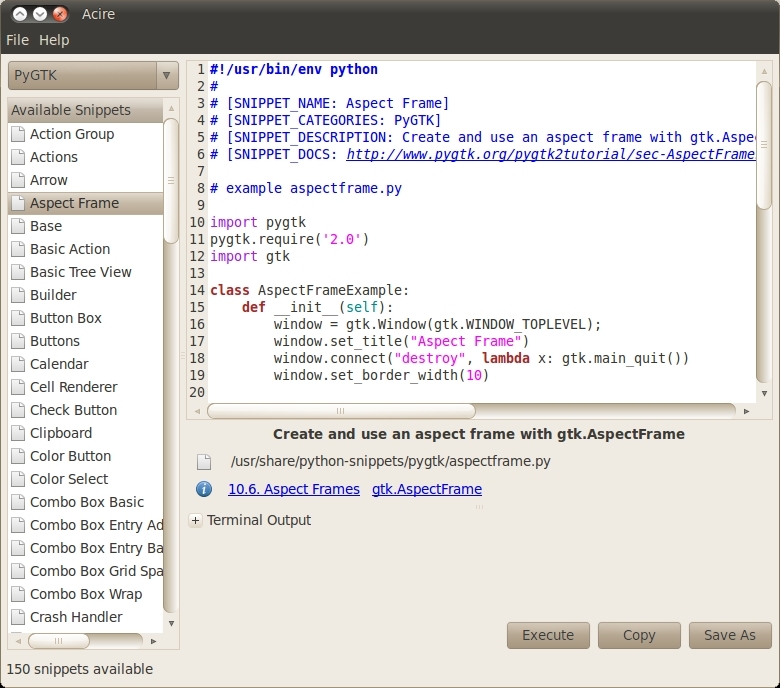 At the heart of the Acire and Python Snippets project are Python snippets that are contibuted by the community. We need YOUR help to produce more snippets to help opportunistic developers really harness our wonderful platform. To contribute a snippet follow the guidelines here. This app is really looking great! I’m willing to see it integrated with quickly and glade in the near future! a tool like this would be useful for Vala, which is poorly documented in terms of examples.